Brett Archibald fell overboard unconscious off a surf charter boat in the middle of a stormy night, being stung by Portuguese man of war and jellyfish, eaten by small fish, attacked by seagulls, hit by a shark plus surviving the ordeal of swimming for 28.5 hours alone in the Mentawai Straits in the Indian Ocean, entrepreneur and successful businessman Brett Archibald is now a sought-after corporate speaker. People cope with trauma and tragedy in different ways, and I feel fortunate to be able to share my story with others in such a way that will perhaps give them an insight as to what I went through and how it has changed my perspective and view of life. I firmly believe we all need to find ways where we can add meaning to our own lives and those around us. South African born Brett Archibald matriculated at Westville Boys High and went on to study at Natal University and UNISA. He completed 5 years of articles at Ernst and Young and went on to become a director at RCI Southern Africa before moving to London as Managing Director for Group RCI EMEAI. His illustrious global career (that included the roles of Group Managing Director of RCI EMEAI with 14 countries reporting in to him, Group Development Director for Wyndham Rental and Exchange in Hong Kong and finally Group Development Director for Wyndham Rental and Exchange Europe, Middle East, Africa, India and Asia based out of London) helped him emerge from the turbulent waters. His incredible focus, belief, determination and will to survive, together with those who saved him, form the backbone of his amazing story that began when he went on a surfing trip to Indonesia with a group of childhood friends. 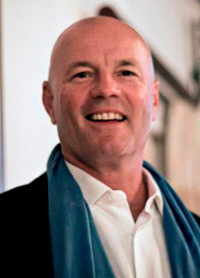 Hailed as the miracle surfing survivor, Brett Archibald is in fact a charismatic, reputed philanthropist who champions for Christel House South Africa in addition to having many diverse business interests. Brett’s account of the experience that changed his life forms the perfect analogy for companies trying to tread water in turbulent times. Book more Corporate Entertainment we have South Africa`s BEST Artists. Hire a Comedian, Master of Ceremonies, Live Bands, Dance Acts, you can even Hire a Magician - We have the very BEST in Live Entertainment for your function or event.